We love Eric Carle books. Alot. They are the books that we return to over and over and over again. One of the things that make Eric Carle books so unique are the way he makes his illustrations. They are made from paper that he has painted and added texture to himself. (You can see more about his process by watching this video.) Once he paints his tissue paper, he uses it to create collages. (You can see more about his process by watching this video.) I think his process is fascinating. Jonah and I had some fun during the “Plague of 2012”. I mean, there are only so many movies a kid can watch when he is sick and it’s raining outside, right?!?! 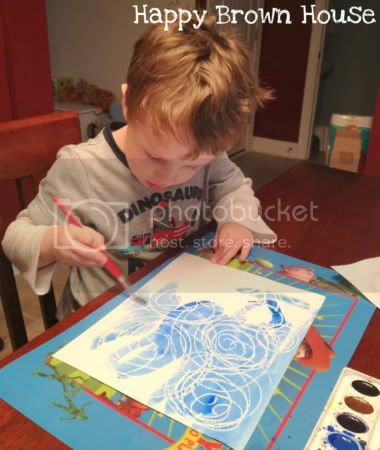 As we were painting with watercolors, I took a white crayon and made a pattern on some paper when he wasn’t looking. When he painted over the white crayon, he thought it was magic. I explained how, this time showing him the process. He painted over it again just as bright-eyed as before. And so it began…The Pretty Paper Factory. The only problem with the Pretty Paper Factory is that eventually, papers are drying on every flat surface. And then, once they are dry, I have a stack of treasures that Jonah won’t part with. Yes, I really cut up his watercolor pages into 4 smaller rectangles. I asked permission first. 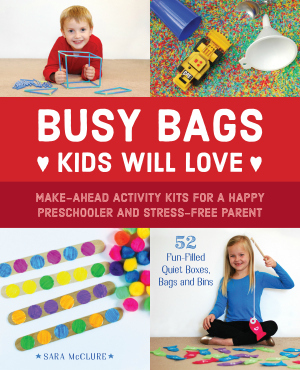 To read about the Collage Box, you’ll have to visit Totally Tots. 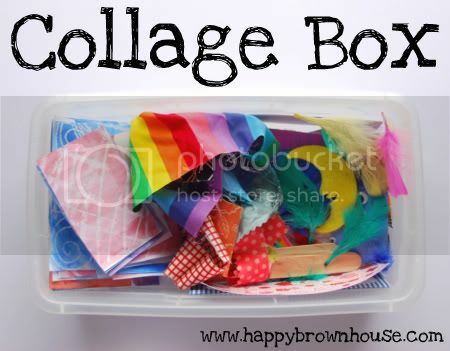 I’m sharing about The Collage Box over there today! Want some other Pretty Paper Factory ideas? I’ll be back with more! Subscribe so you don’t miss them! The Collage Box is a stroke of brilliance! We have artwork piling up too, and I had been wondering what to do with it. 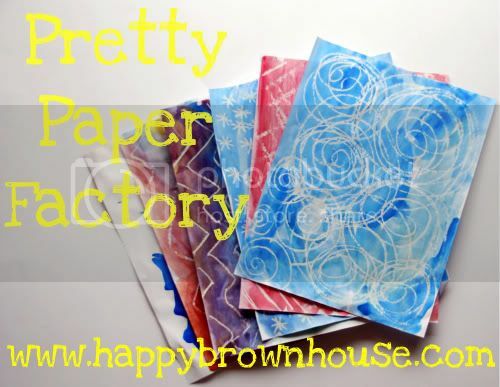 Oooo, I love this idea of ‘pretty paper factory’ and am certain my toddler would have a FIELD DAY water coloring and watching the designs [magically] appear! My question is, on your pretty papers, did you use a white crayon for the designs? I’m sorry, I sent that reply prematurely 🙁 I have watched the tutorials and re-read your post (silly mommy, had too much going on at once to FOCUS, sorry)… anywho, THANKS for such a greeeaaaat idea! Yes, we drew on white paper with a white crayon, then we watercolored over it. This works for “ocean” scene pictures, too. Enjoy! My son would love to explore the contents of this treasure box. It was so easy to pull together! Hope you make one! So pretty! The collage box is a great idea. I love that you just made pretty patterns vs something like snowflakes, etc. Thank you! It is a lot of fun!